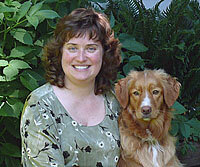 Student testimonials for dog agility instructor, Sylvie Fefer. "Sylvie is someone with a lot of experience, knowledge, drive and passion for this sport and that is exactly what anyone who would like to be involved in agility should look for in a teacher. My dog Bella and I have been taking her classes for about 4 months now and it's unbelievable to see what we have already achieved. It's amazing to see how important foundation work is and how it translates into a dog that totally understands what is expected of him/her, making it easier and even much more fun (for both the handler and the dog) to do agility. 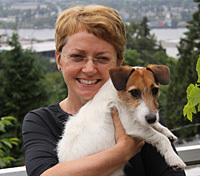 I highly recommend Sylvie to all agility enthusiasts; whether you are training as a hobby or planning to compete nationally and internationally, being a beginner or already experienced, Sylvie has the dog handling and teaching skills to help you achieve your goals." 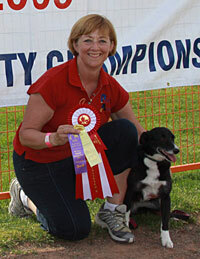 "Hyde, my Basenji/Border Collie mix and I have been competing in agility for 6 years now. We have had the pleasure of Sylvie's instruction for about 2 years. 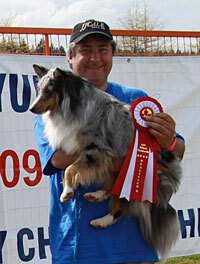 This year Hyde received her Agility Trial Champion of Canada title of which I am very proud. Thanks to Sylvie's method of teaching my handling has become more consistent and confident. When walking a course I know how to handle the sequence of obstacles presented and if in doubt I have definite rules to follow which assist me in making good decisions (at least most of the time!). Hyde has benefited from my improved handling but also from the weekly practise with Sylvie. She has helped us refine our approach to obstacle performance by challenging us with manageable drills which are always incorporated into a fun agility course. Sylvie provides clear and precise explanations and is positively responsive to all our questions. She is always smiling and ready to laugh with her students, either at their unusual mistakes or at their dogs entertaining antics. I highly recommend Sylvie as an agility instructor. You will see results." 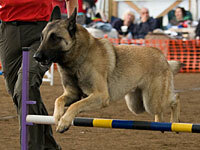 "Before I started taking classes from Sylvie, I did not even really understand the sport of agility. Now I understand that it is a team sport – that me and my dog Rusty get to work together to move through a course with speed, efficiency and fun! I’ve learned that there is a system involved in training agility and have started to learn that system’s principles and I can teach Rusty to work with me by using this system consistently. I learned this because Sylvie is clear and comprehensive in her instruction — we learn not only what we need to know but why we need to know it. Sylvie gives great feedback, both encouraging words and constructive criticism. And we have fun, fun, fun! (Rusty says grrr...give me da tug!)" 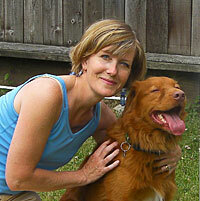 "I have been taking weekly agility classes with Sylvie for two years. I have found her instructional style to be focused and direct, quickly identifying handler errors and giving corrective feedback. Sylvie plans each lesson around one or two specific skills; thus our sessions always have a clear purpose so we experience improvement each week. When there are various handling options for a course sequence we practice them all and discuss their pros and cons. Then we can make good choices with our own dogs. I have enjoyed Sylvie’s clear teaching style as well as her sense of humour and would definitely recommend her as an agility instructor." "Sylvie clearly enjoys teaching agility. Each class is taught with enthusiasm, a great sense of humour, and a sharp eye for detail. Her systematic approach for teaching the 'rules' of handling make it so much easier for me when I compete at agility trials. She has helped me immensely with methods to motivate my dogs, and always has good, constructive criticism to correct any handling errors I might make. I would highly recommend her to anyone thinking about taking up the sport of agility, even if you think you don't want to compete. She just might convert you!" 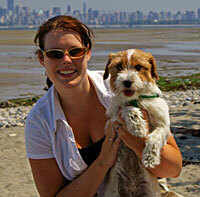 "Sylvie has a methodical approach to training and a great eye for identifying even minor weaknesses in my handling. She is patient and helpful and really wants to make winners out of her students. Her classes focus on specific skills that directly help us in competitive trials and improve our chances of getting clean runs. I always look forward to my class with Sylvie but not as much as Sassy does!"